I have an aunt that’s really good at doing one thing with her Facebook… And that’s making me feel like I’m dying a slow, painful death from starvation. She’s the queen food and recipe poster. It’s not just one or two things she posts that looks delicious and I feel I HAVE to eat, it’s all of them. Literally, all of them. Even the seafood ones. And I still, in my early 30s cannot do the texture of seafood. But, I’m willing to try for the sake of eating some of these dishes. 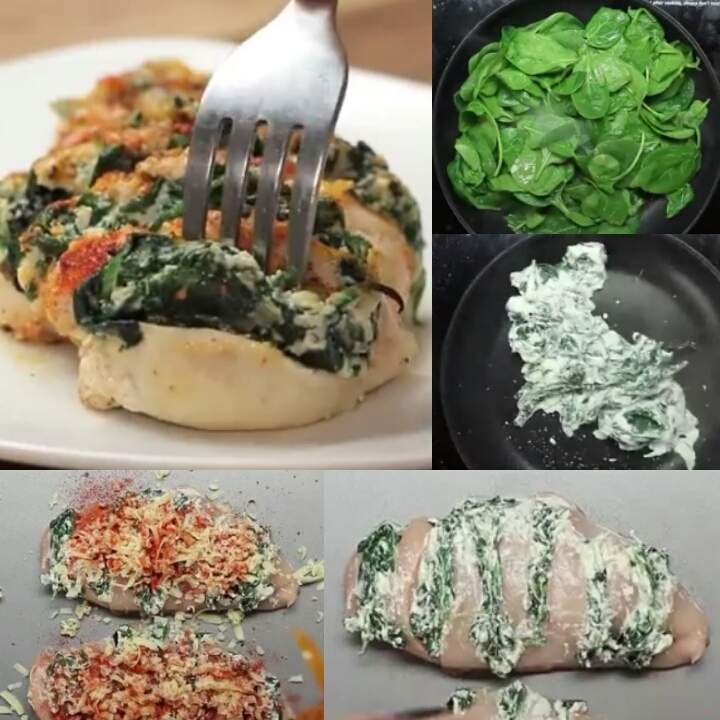 The other day, she posted one of those quick-flashing video recipes that had spinach, ricotta, chicken, cheese and paprika… It looked quick and simple to prep, and delicious to eat. I learned pretty quickly last night that it was either REALLY small chicken boobies used, or they really skimped on the spinach and ricotta. Pre-heat your oven to 400-degrees fahrenheit (about 200-degree celsius). Cook down the spinach in a small skillet with about a tablespoon of olive oil. Add in ricotta and mix well. Take the chicken breast and spacing each cut about 1-inch apart, slice “valleys”. DO NOT GO ALL THE WAY THROUGH. Stuff in the spinach and ricotta. Sprinkle with a dash of salt and pepper. Now, if you’re like me with cheese (very generous), I suggest putting the breasts in the pan (glass is best) first. THEN cover with cheese and sprinkle on the paprika. Bake in the oven for about 30-minutes. For starters, I had to double the spinach and ricotta. So I used about 2/3-cup for each instead. Second, my boobies were about a half-pound each, so that made me need to adjust my cooking time to 45-minutes instead of 30. And I used fiesta blend instead of cheddar for more “oomph” in taste. Supplement education – family style.